Before I even clicked on the link my interest had already piqued. It’s rare these days that I get very excited from an email, but this is a little different. What happened next has also become a regular part of daily life. 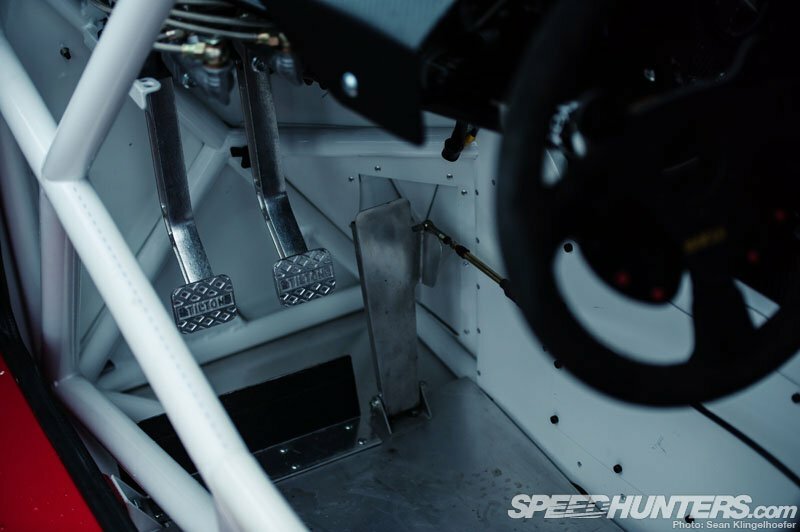 I entered the online Speedhunters work area where a discussion was already being formed detailing a list of vehicles that Paddy, Dino and myself would be divvying up to feature. The latest creation to be tacked onto the list is quite possibly the most interesting car I’ve seen in recent memory. When I finally landed at the bottom of the thread there were two images attached that were scarcely larger than thumbnails. The images depicted a car that could only be described as a work-in-progress, but already I could see the potential oozing from the pixels. As an American, the thought of a Lancia Delta Integrale even in stock form is an exotic delicacy. To have the chance to witness, let alone photograph, something of this scale is a once-in-a-lifetime opportunity. At this point I still had no idea who would be shooting the car, and as my colleague Mr. Dalle Carbonare is of course very Italian, I would have happily grudgingly gifted the opportunity to him. Had I any idea how little the already obviously extreme exterior was giving away, perhaps I would have called dibs right there on the spot. But rather than trying to stake my claim to the car, I let out the only response my fingers could muster. 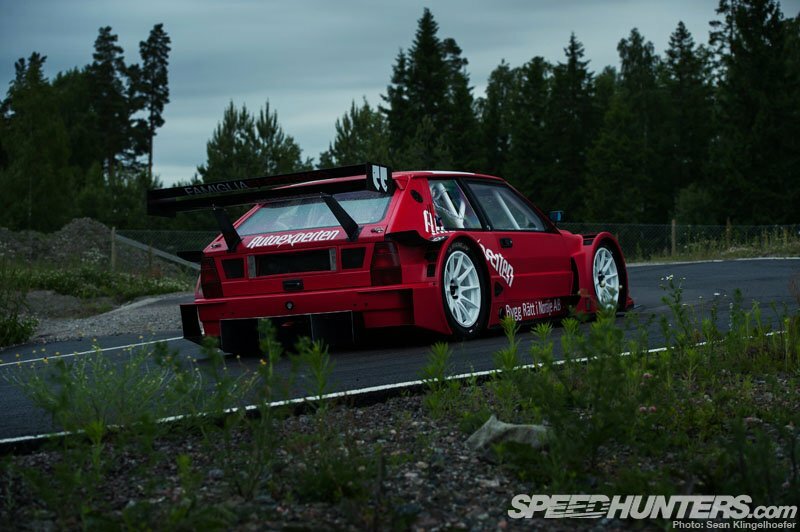 “Whoa”, I typed, “Epic Lancia is Epic!” What I didn’t realize was how epic the car Peter Pentell had built truly was. When I arrived at Gröndal my body and mind weren’t exactly sure what the hell was going on. The last thing I remembered was meeting up with the rest of the Speedhunters and special guest Miura-San in the hotel lobby before traveling some amount of time (the exact passage I’ll never know as, in rare form, I slept in the car on the way to the circuit) and abruptly arriving in a forest that conveniently had a tarmac ribbon dissecting it. 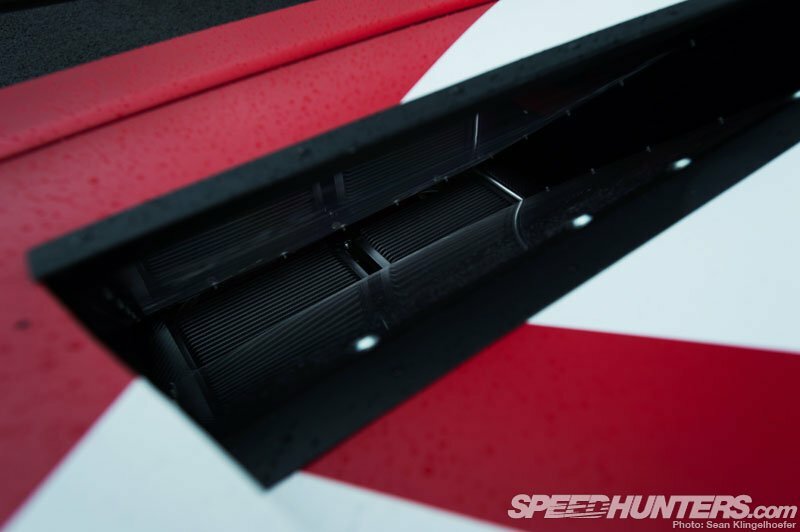 As our car came to a halt I wiped the sleep from my eyes to get a better look at the Speedhunters’ new test and photography track, which on this occasion was filled to the brim with feature cars to shoot. The whole lot of vehicles, which you’ll bear witness to in due time, was impressive to say the least – yet there was one car that seemed to stand above the rest. The car was still sitting on the trailer when I got out of the car and put on my jacket. Living in Hollywood I’ve become quite used to bumping into celebrities and acting casual, but there was something about this car that had me – for lack of a better word – starstruck. For some reason I felt as though I couldn’t look it directly in the eye; possibly from fear of ‘meeting your idols’. Eventually the car was lowered to ground level where it was being inspected by Kei Miura. Seeing his eagerness to check out the Lancia helped to get me over my stage fright and I moved in closer and started looking over the bodywork. 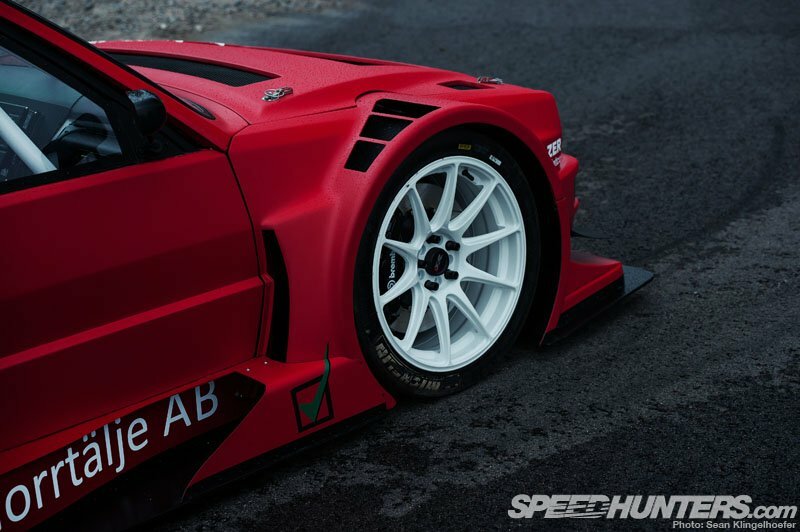 Having seen lots of Gatebil cars in the past I was expecting this build to be a real ‘fifty-footer’ but the reality couldn’t be further from the truth. 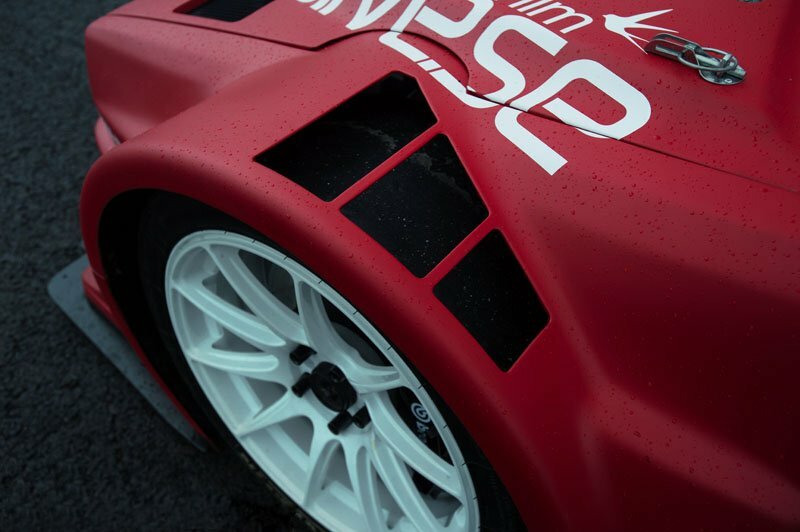 The shape and lines of the bodywork were so clean but curiously exaggerated. Not being an expert on the chassis it was difficult for me to make out exactly what bits had been changed, but I suspected a whole lot of custom work had been performed. I would later find out that virtually the entire exterior of the car save for the door handles and front grill were custom made in a garage. For now however, I was simply admiring the form. I’ve often half-jokingly muttered the phrase “I’d rather be lucky than good,” but on this particular occasion it was the truth. I had arrived at the circuit that day without a shadow of a doubt as to which vehicles I would be shooting, but as it turned out, the cards would soon reveal themselves in my favor. The epic Lancia was mine, and it would take a lot more than a little rain to keep me from shooting it. After introducing myself to Peter it was time to position the car on track and begin truly familiarizing myself. What I began to understand soon after we parked up was how little Lancia this car actually was and how it was rather a lot more Toyota Supra than anything else. With the bonnet removed for the first time, I started to realize just how #$@*ing mental the Lasupra really was. 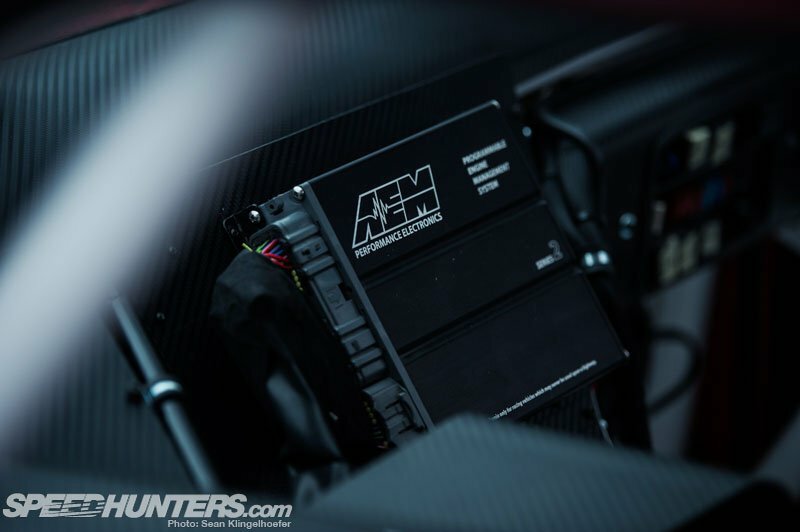 Anyone who is familiar with the Gatebil tuning scene will know that the Supra and virtually all of its component parts are highly valued in Scandinvia, so seeing their turbocharged three liters powering other cars is pretty common. In this particular bay the top of the unmistakable 2JZ doesn’t necessarily slap you in the face, but once you ponder the absurdity of the way it’s been placed the familiar sting sets in. The entirety of the engine from the crank-pulley back is now sitting just behind the front axle line. Peter modestly told me he tried to place everything in “suitable locations for good weight-ratio.” I chuckled because I had yet to realize the full insanity that still lay in the voids just begging to be discovered. 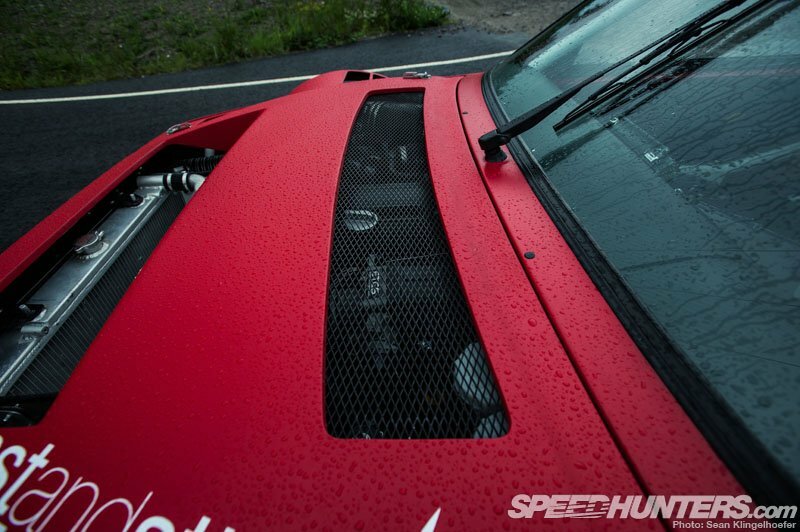 As I hinted earlier, more than just an engine was borrowed from a Supra. You’ll be happy to know the entire driveline including the transmission and rear end have all been pulled from a JZA80. 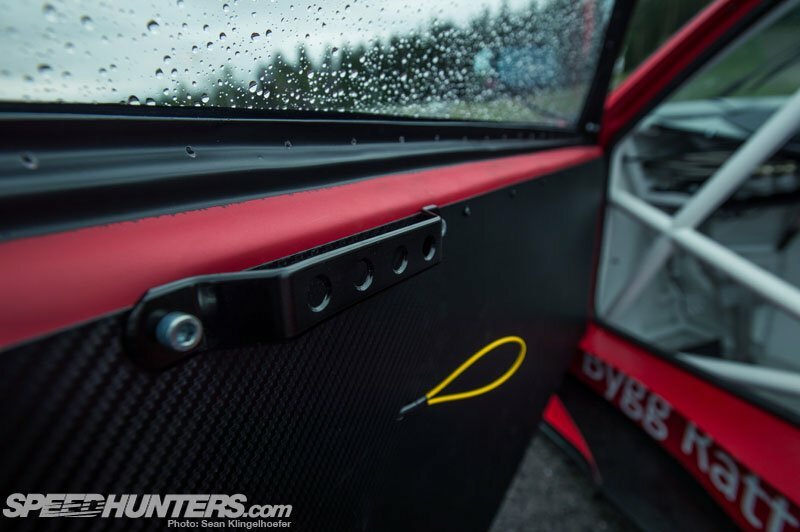 Just for good measure, each component has dedicated coolers mounted in the rear of the car with a channel cut in the body to look after their temps. While a standard Supra powerplant would be more than enough to motivate a car of this weight, Peter (being Swedish and all) had other ideas. 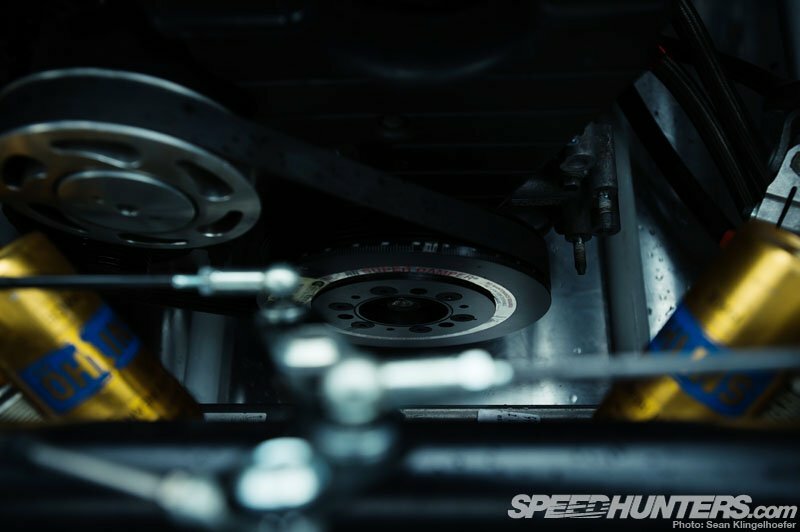 With help from the 2JZ specialists mentalists at Supramannen Racing, he was able to source all the parts necessary to assemble his automotive perversion. I could dazzle you with a list of components but I fear name dropping would only belittle a build of this caliber. Let’s just say that once it’s been properly tuned, this particular motor should be singing a tune somewhere in the neighborhood of a thousand horsepower. 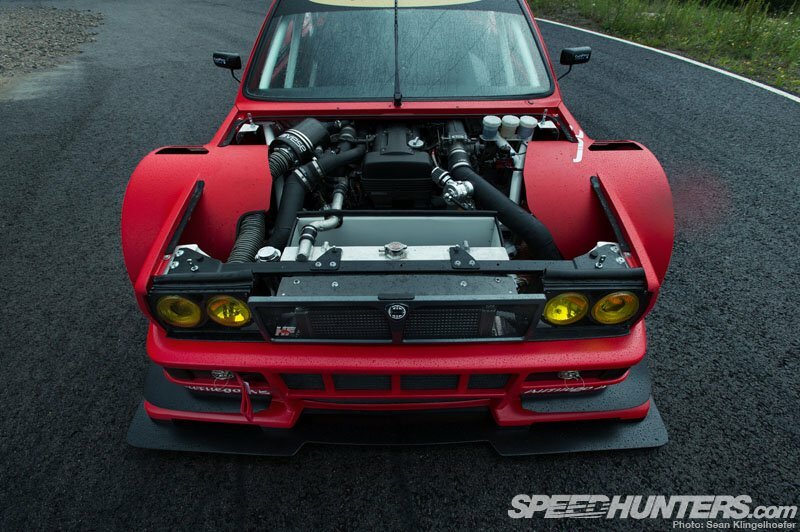 An output like that would be right at home as a blurb on the cover of virtually any tuning magazine on the planet, yet it still isn’t what makes this car so special. No, for that you’ll have to peer well past the surface, which may be easier said than done. 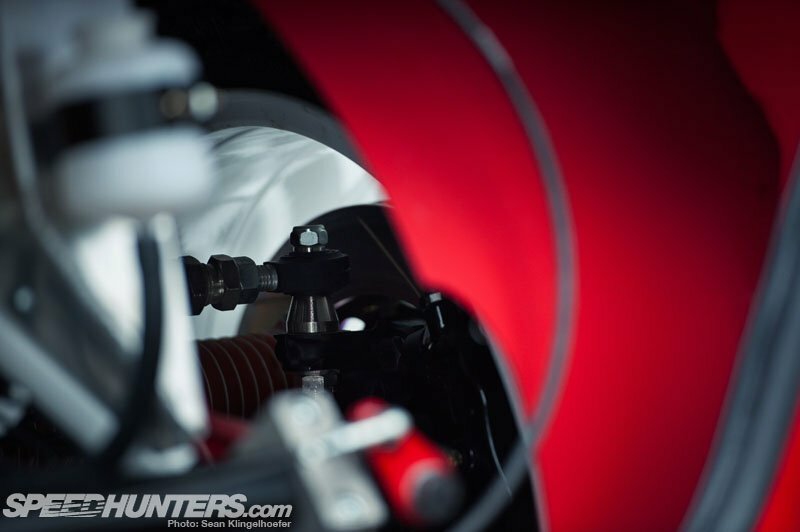 Your first opportunity for a glimpse into the true brilliance of this build is awaiting you on just the other side of the door; all you have to do is gently pry open one of the last remaining OEM pieces of Delta and enter. On the inside even a Lancia ignorant like myself can tell that something isn’t quite right here. 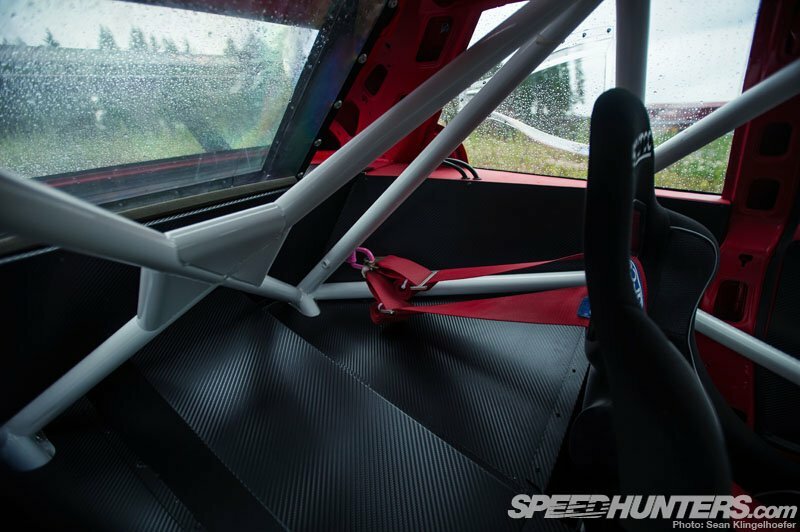 At first glance you begin to see a complex matrix of pipework in the form of a roll cage, but it doesn’t seem to terminate anywhere. What you’re actually seeing is indeed part safety structure, but it’s also very much the foundation of a home-brewed spaceframe. Taking a good look around the cabin reveals a level of detail and obsession that looks a lot more like a factory works effort of the period rather than some sheet metal thrown together by a guy in a shed. Yet in reality only the latter is truth, and the hard work has done an excellent job at hiding the fact that this Lancia is nothing more than an impostor – a roof skin scantily placed atop a fantastic jungle gym. The seating position is nothing less than ideal and has been shoved about as far back as it can go, with the driver’s shoulders slightly rearward of the B-pillar. Although I didn’t actually take a seat inside the car, I can quite easily imagine the false sense of immortality that such a throne might induce. For anyone who’s driven a car in anger, the view forward is one to die for. Just outside of the pilot’s peripheral vision are yet even more man hours of fabrication. 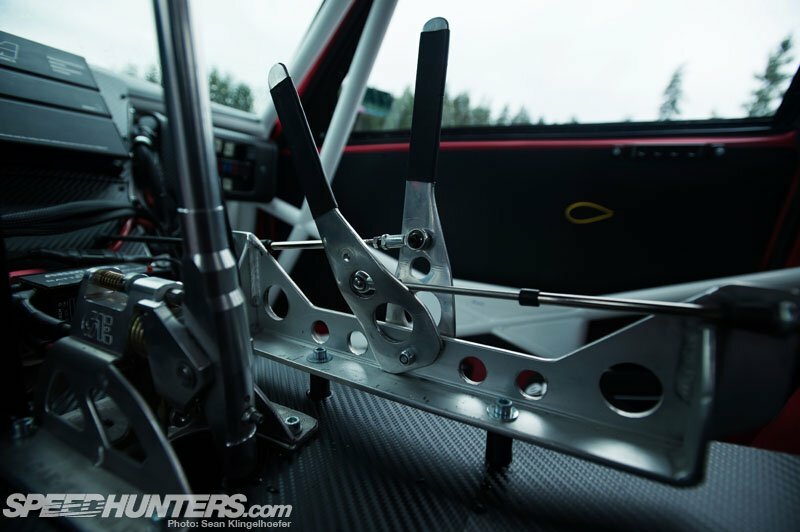 To make up for the revised seating location, custom pedals have been used and mounted nearly a foot aft of their original home to accommodate the rearward bias. Just to the right of the driver’s throttle leg is the massive transmission tunnel, and atop of that a collection of electronics resides. All of the instrumentation, of which there is relatively little when comparatively speaking, have then been arranged in a driver-centric array – one of the many luxuries of building a completely bespoke car. Everything that isn’t immediately pertinent to the driving experience has been placed on a secondary parcel that lies yonder of the gauge panel just out of sight. 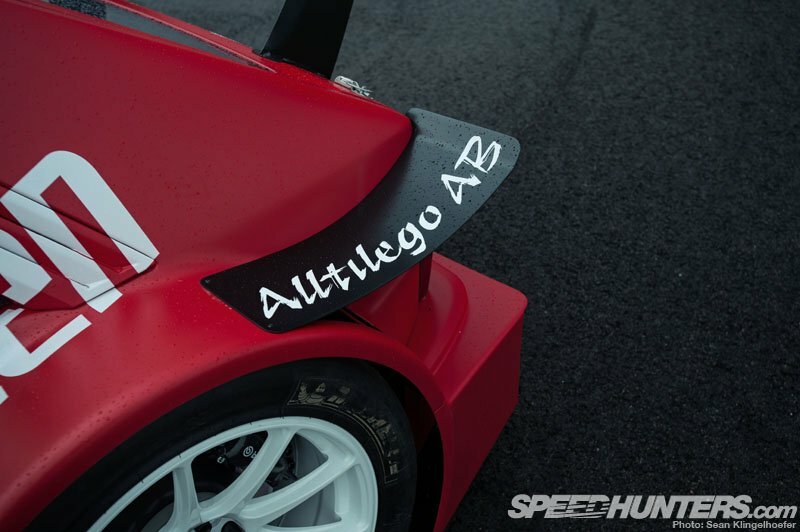 While we could quite happily end on that note, there are still many other pieces obscured from the driver’s seat that makes this car even more extreme. Sure the power train, cockpit and bodywork are magnificent in their own account, but the underpinning of the whole build is possibly the most impressive thing I’ve seen in some time. In 2011, starting with a jig, a saw and the body of a Delta he had owned for a decade, Peter suffered from what I can only presume was a mental breakdown. 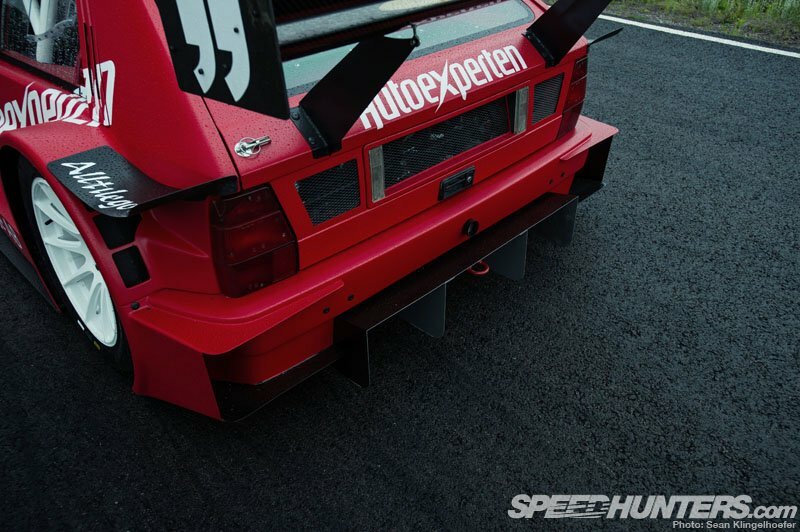 From there he hacked the lid off the poor Lancia and slid it over the top of a metal frame. He then meticulously added bits of metal which eventually constructed a frame. At the four corners of this grid work lay a set of Supra uprights. From this skeleton the madman went to work, intersecting lines and tigging them in place. At some point he must have realized that he needed to utilize a shock absorber of some type but clearly forgot to allocate an appropriate space for them. Either that, or he really is a genius. 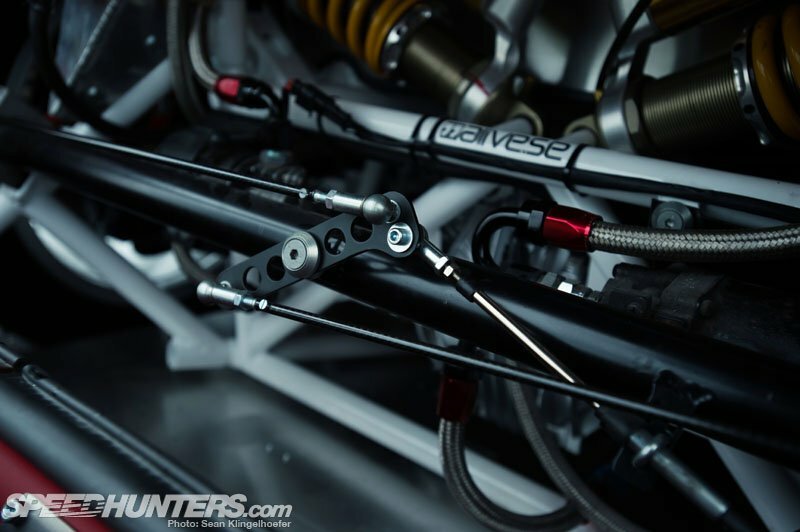 Regardless of the reasoning, Peter made the decision to mount a set of four-way adjustable racing dampers completely inboard, actuated by push-rods. 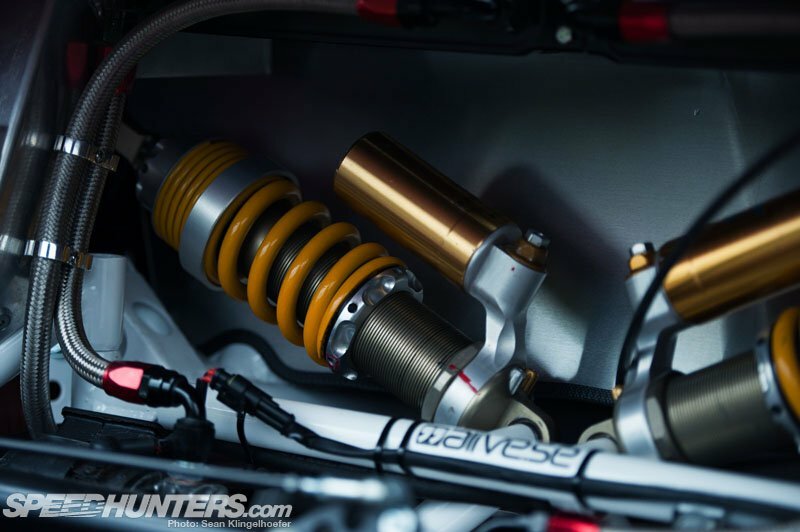 While this type of elaborate suspension is commonplace in hypercars and at the pinnacle of motorsport, I don’t know too many guys firing up their welders and giving something this sophisticated a go in their garage. 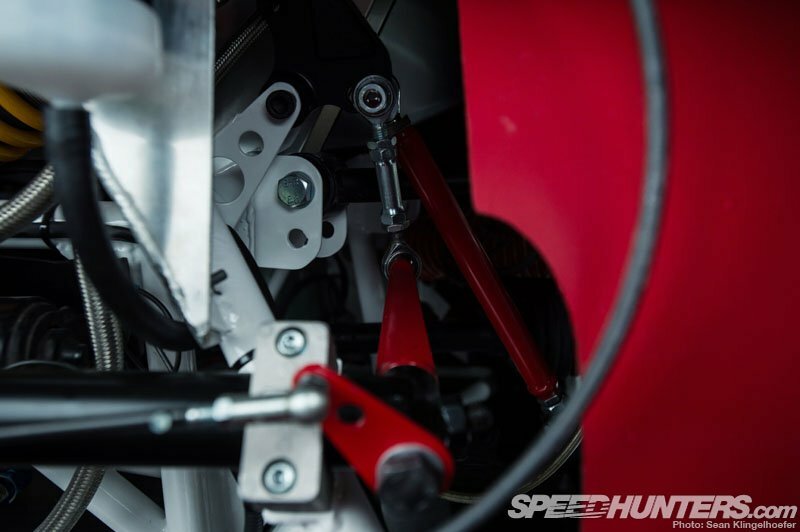 With the brunt of the suspension taken care of, there were still a few loose ends to tie off, like what type of sway-bar to use. If history has taught us anything about Peter he surely wouldn’t take the easy route. In the end a five-position driver-adjustable dual-knife set-up was utilized; I suppose anything less would be uncivilized. 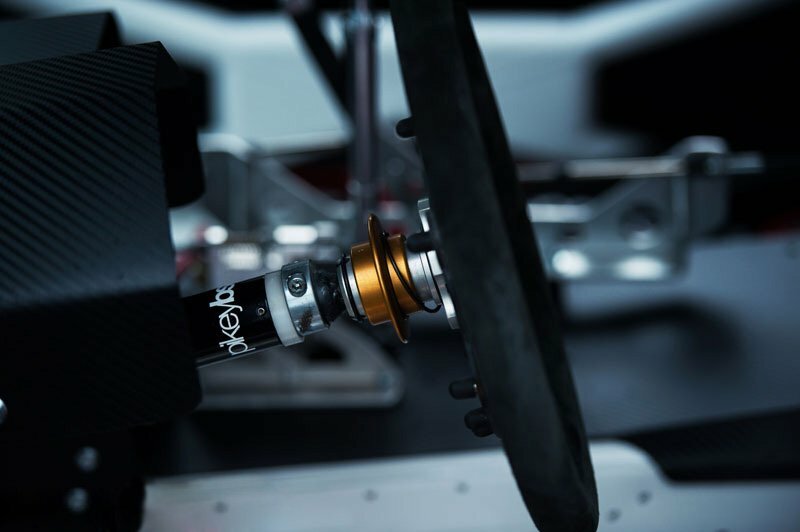 The lever system sits adjacent to the shifter ready to be fine-tuned at a moment’s notice should weather or other conditions require an immediate change in set-up. To call the build merely inspirational would be an insult. While I’m sure there will be some people out there thinking “Why on earth would anyone do this?”, I can’t help but think “why on earth aren’t more people?”. Not only is it one of (if not the) most inventive cars I’ve ever had the pleasure of photographing, it’s also almost entirely garage-built by the owner. For a long time I’ve been a firm believer in the idea that you can do anything you put your mind to, but the simple fact of the matter is that most people never put theirs to it. Seeing this kind of perfectionism harbored under such modest conditions was a welcomed slice of humble pie. I believe I wasn’t alone in leaving the circuit feeling inspired that day. 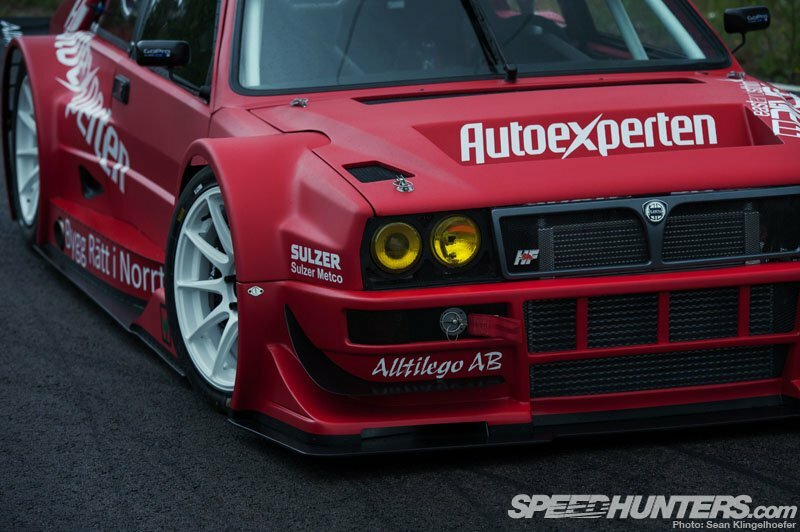 Over the course of the weekend the Speedhunters crew was able to see the car make its maiden voyage on track at Gatebil Mantorp Park. It was only then that Dino finally got a good look at the stunning creation. After a great deal of contemplation and discussion, we eventually arrived at the conclusion that after nearly twenty years of combined experience as automotive journalists, this was quite possibly the most radical thing either of us had ever seen. Yet what it is exactly I’m still not certain. This is not a car, of that I’m sure; it’s the physical manifestation of creativity, patience, skill and hard work. In many ways I would argue that this automotive expression is actually art, yet at the end of the day that still doesn’t feel quite right. No, there’s really only one way to describe it. 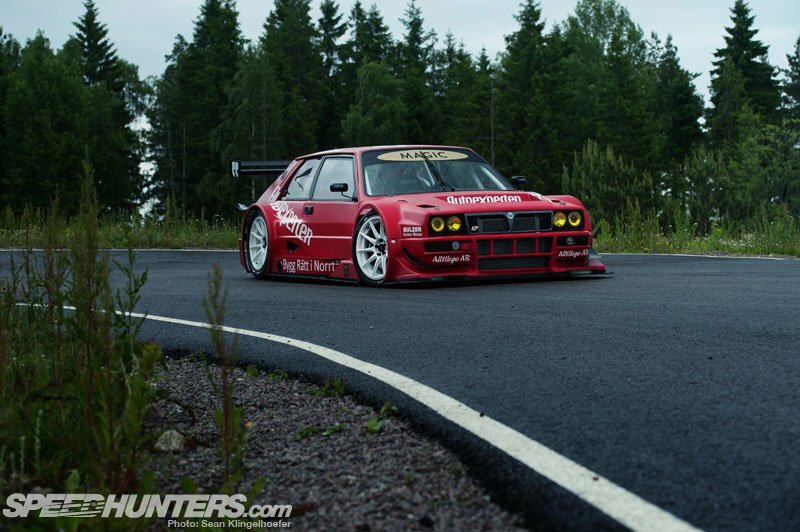 Epic Lancia is, for lack of a better phrase… epic.